The Ducks were facing their second loss in two days: Top of the seventh, down 4-1 to the No. 10-ranked UCLA Bruins. With one runner out, Sammie Puentes, Oregon’s base-running specialist, stood on second base. The next batter, Koral Costa smacked a single into the outfield and the 5’2″ Puentes flew around third and streaked for home where the beefy Bruin catcher, Stephany LaRosa, stood blocking the plate. 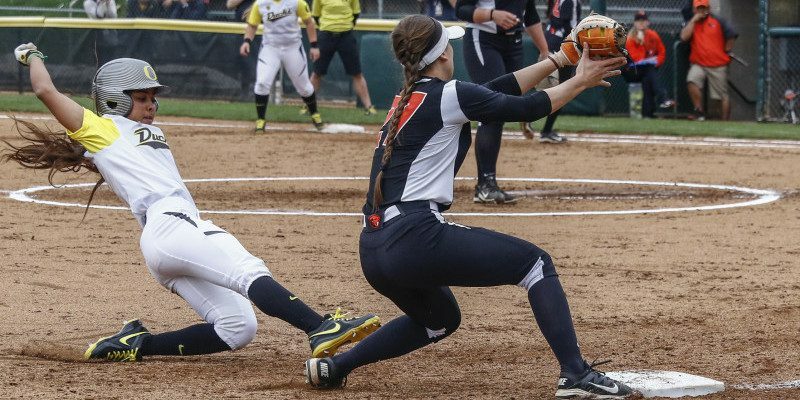 The throw and the runner arrived at the same time, but Puentes slid between LaRosa’s legs, knocking the ball from the catcher’s hand and scoring the Ducks’ second run of the game. More importantly, she kept the rally alive enabling the next batter, Lauren Lindvall to homer and drive in three runs, moving Oregon into the lead 5-4 . The Ducks eventually won the game 6-4. Softball’s liberal substitution rules have created a specialist role for the pinch runner and Puentes has made the most of the opportunity. The sophomore from Hollister, California, is an expert in the 60-foot dash — the distance between bases — with enough speed to make Robert Johnson, the Duck track coach, drool. Puentes does more for the Ducks than just run, however. She’s an excellent infielder and good hitter, hitting a cool .300 during her freshman season with a pair of home runs, one of them a pinch-hit grand slam against Cal. For her efforts last year, Puentes received an honorable mention for the freshman all-Pac-12 team and in short order she has become an integral part of the Oregon offense, a speedy base runner, fearless and willing to collide with opposing catchers that outweigh her by 50 pounds or better. Guts, speed and determination: she’s the perfect player to help Ducks on their road to the College World Series.